A good family pet as well as a keen guard dog. Beautifully presented on a unique Blue Witch ceramic. Originally a farm dog, the Bouvier Des Flandres are now often used as guard or police dogs as well as being kept as pets. Our Blue Witch Coffee Mug is individually handmade and displays striking detail. Each mug is unique and patiently hand painted by a talented artist with precision to emphasize the character design; it takes nearly 2 weeks to complete the entire process. Only love can make it happen. A perfect cup of tea; every mug is dishwasher safe and microwave friendly ensuring the colour will never fade. Carefully protected in a Blue Witch gift box which includes a certificate signed by the artist. What a perfect Bouvier Des Flandres gift idea! 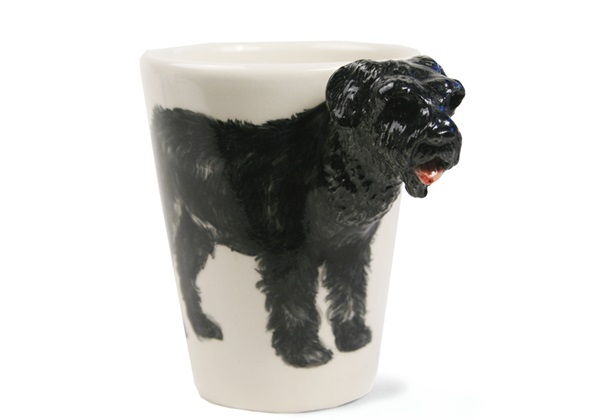 Our Bouvier Des Flandres Coffee Mug is individually handmade and hand painted by a talented artist. Each brush stroke perfectly highlights the character design.